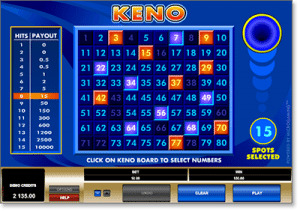 Keno is Australia’s favourite quick-draw lotto game, available at pubs, clubs, and land-based casinos all over the country. It’s also available online, which means international casino players are becoming more and more interested in the game. We take a look at what’s on offer for Australians, the Brits, and the rest of the world in regards to keno. For the best digital keno on the Web, head to one of our top-ranked Internet casinos listed above. Each of these trusted gaming operators offers both free play and real cash keno, and accepts AUD transactions via credit and debit cards (Visa, MasterCard), e-wallets (Skrill, Neteller), and many more secure banking methods. Our number one gambling site here at Keno Sites Australia is Emu casino, which carries some 800+ online casino games for desktop via instant play, and mobile. New players can get $3 no deposit required to try the huge range of RNG keno on offer. Most online keno titles use a random number generator (RNG) – the same kind of engine which drives all your favourite Internet blackjack, roulette, and pokies games. The RNGs used by our recommended online casinos are regularly assessed by independent third-party testers to ensure all results are fair, honest, and 100% unpredictable by players and operators alike. Here’s our picks for the best RNG-based keno games at our top real money gaming websites. As with just about every other aspect of online gambling, Microgaming sets the standard for Web-based RNG keno with a release which hits all the right notes. Simply titled “Keno”, here we can select up to 15 spots from a grid numbered 1 through 80 – just like the video keno games at your local watering hole. Each round sees 20 numbers drawn at random, and if you catch enough hits you get a payout according to the chart on the left of screen. We can bet up to $10 per round, with a maximum payout of $100,000 for hitting 15 spots. Find it at Guts online casino. Net Entertainment’s Bonus Keno title brings exactly the kind graphic quality and gameplay incentives we’ve come to expect from the developer’s online pokies and video poker classics. Like Microgaming’s keno platform, 20 balls are drawn via RNG from the numbers 1 through 80 – but we can only select up to 10 spots here. There are two big sweeteners, though: the bonus round, which awards a free game with 2x payouts when you collect five Jokers (which can appear at random); and a progressive jackpot, which pays out when all drawn numbers form the letter “J” in real money play. You can try Bonus Keno out at Guts.com. Instant Keno – This one uses more or less the same format, betting options, and pay scale as Traditional Keno, but with a funkier visual layout and (ironically) a slightly slower, more conventional pace of play. Klub Keno – The best-looking game in the BetSoft set, Klub Keno uses a condensed 40-ball format where only 10 numbers are drawn each round. Look out for the special Star Ball, which doubles all payouts whenever it appears. Land 10 hits with a Star Ball in the mix to win up to $30,000. Krazy Keno – This is a lighter version of Instant Keno, with only 40 numbers in the barrel. Pub lotto doesn’t get any simpler than this. All of these great keno titles by BetSoft are available to play for real money exclusively at Emu Casino. Because keno isn’t quite as popular as instant play pokies or real money blackjack, at the moment there aren’t heaps of options for when it comes to the mobile arena. We expect that to change over the coming year or so as on-the-go gaming technology continues to grow and mobile casinos begin to expand their catalogues. You can check out what’s on offer by heading to our page dedicated to mobile keno. 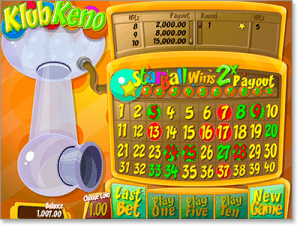 Live online keno combines the traditional hand-drawn game with all the modern gameplay benefits of digital gambling. Rather than using RNGs to produce results, live dealer games are drawn by real people using a mechanical barrel and numbered balls – much like your standard Tattslotto or Powerball drawing. All the action is captured on a High Definition video feed, which is beamed in real time right to your desktop computer, smart TV, or mobile device. These games are only available in real money mode, as they are significantly more costly to run than RNG casino games. Ezugi was the only live dealer provider to offer live keno, but it appears it has taken the tables offline.